I love the dramatic views and the wide open spaces of the Western U.S. This view of the Chiricahuas changes depending on the time of day, the season and the weather – and its reflection in the pond is changed by wind and water levels as well. These mountains have been the backdrop for significant changes in the ecosystems in the valley below. The Apaches used the grasslands for hunting. In the late 1800’s, ranchers over-grazed the area so severely that much of the grass has been replaced by mesquite and similar shrubs and the intermittent rains contribute to gully erosion. Mining spurred the boom and bust of nearby towns. When the spaces seem so open, people often act as though their choices will not affect the land and its inhabitants. But they do. This pond reflects a new type of impact on the land. Terry Morgan and I created it on our property here with the hope of providing habitat for birds, animals and plants that once used the natural pools and ponds in the region. New plantings around the pond will reintroduce native grasses. We hope to recreate ecosystems that are compatible with the area’s climate, topography and soils. 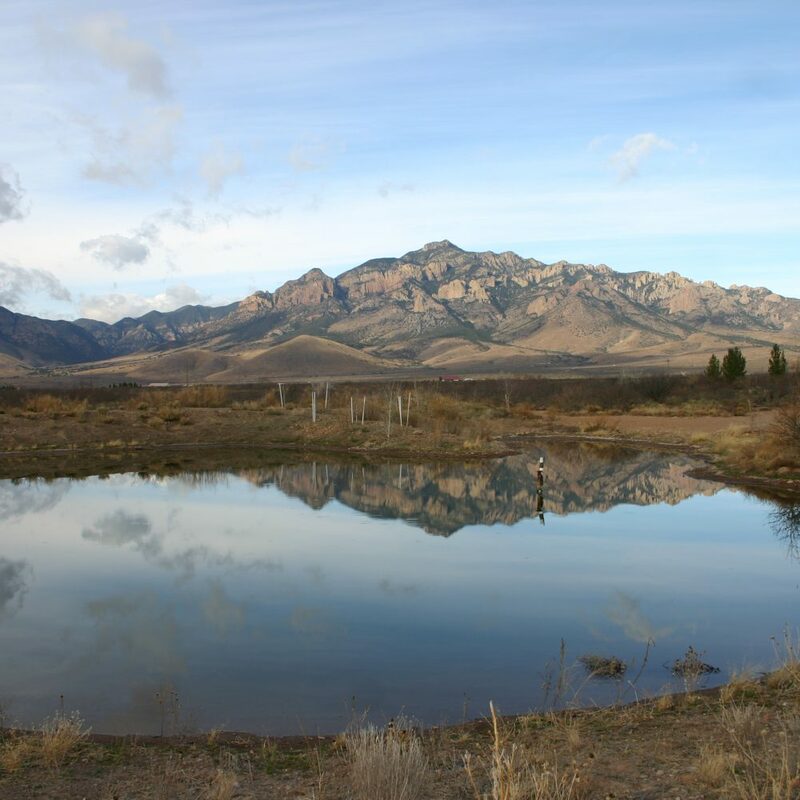 If we’re successful, the pond may provide a new home for endangered Chiricahua leopard frogs as well as a resting place for migrating ducks and shorebirds. Historically, the economies of the West have been based on resource extraction or consumption. Most recently, many areas have responded to dramatic population growth by creating sprawling suburbs that could exist almost anywhere. In the future, communities may be most successful if they retain or recreate the natural habitats and settings that make their locations unique. Ecotourism offers one economic possibility for the Chiricahuas – a destination for birders worldwide – and similar areas. Human efforts to recreates natural ecosystems, landscape with native plants and design buildings suited to local climates should also support sustainability. The result may be communities that are appropriate to their natural settings, designed with environmental systems that create good places to live for their residents, human and otherwise. @2018 Strategic Community Solutions. All rights reserved.